Anyone who has bitten down into a gingerbread cookie knows that the taste of ginger is powerful but delicious. For thousands of years, ginger has been used to cure sickness and strengthen the body. Ginger has been shown to have major health benefits! As it turns out, ginger has a sibling that may have the same health benefits. Ginger water is the latest trend that uses ginger roots the same way you would use a tea bag. It is a great way to heal your body and it doesn’t have the caffeine and sugar many teas have! First things first, ginger water is incredibly easy to make. You start by boiling about four cups of water. Next, you add half a teaspoon worth of ginger. Once the ginger is introduced into the boiling water, remove the pot and allow the ginger to seep into the water. It will take approximately ten minutes for the spice to flavor the water. Lastly, you will need to remove the chunks of ginger, strainer is a preferred method of accomplishing this. The ginger water can be consumed either hot or cold. If the taste seems bitter, then you can add honey, lemon, or sugar to sweeten it up. Making the ginger water is incredibly easy to make and should take no more than 15 minutes! Many of the benefits that come from eating ginger overlap with the benefits of drinking ginger water. The common denominator between the two is ginger. Ginger has substantial health benefits that effect most of the various systems of the body. Many studies have been conducted that show these benefits. The kicker is that the studies have been conducted on ginger, not necessarily ginger water. Regardless, consuming ginger decreases pain levels and nausea. As if that’s not enough to make someone want to drink ginger water daily, it also lowers cholesterol levels and blood sugar. The best part is that ginger water can also assist with weight loss! Anything consumed in excess can have negative side effects. Drinking too much ginger water can give someone gas, diarrhea, and heartburn. 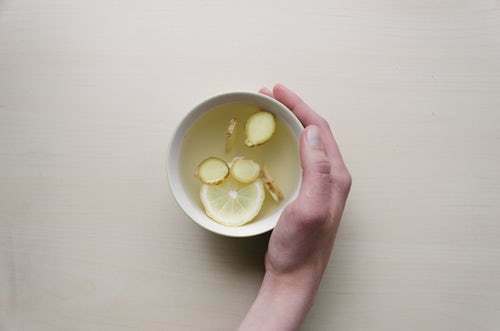 Some abdominal pain has occurred in people when they drink too much ginger water. There are rumors that state that drinking ginger water while pregnant is dangerous for the mother and the baby. That is not true. Ginger water is safe to drink while pregnant, but the key is that you drink it in moderation. Ginger is a natural substance and it is rare for natural substances to harm people. Like anything, ginger water can have negative side effects, but only when you drink too much of it! Ginger and ginger water have substantial health benefits that keep people fit and can help you lose weight. It is quick and easy to make ginger water, and could easily be taken on the go. If you drink too much ginger water, then there are possible side effects that can occur. From heartburn to abdominal pain, these side effects are rare but can happen. Also, ginger water is safe to drink while pregnant. Ginger isn’t just a nickname used to describe red-heads, it’s also a great food that can increase your health daily!